Online streaming: a step backwards? I’ve finally given up on online streaming subscriptions. After many frustrations, this morning I cancelled my Amazon Prime Instant Video subscription with an exasperated sigh. I will explain why. I was an early adopter and enthusiastic user of Lovefilm. I remember the dreadful old days, when trips to the local Blockbuster would usually end in disappointment because all of the decent films had been rented or the film I wanted to see was unavailable on their pitiful back catalogue. If I did find something to watch, I’d have to hand over the best part of a fiver before dashing back to the store within a day or two in order to avoid a late fee. The thought of the £10 fine I received once still rankles to this very day. So the emergence of a postal DVD rental service with no late fees and an enormous back catalogue was a most welcome development. But things have changed. Not long back, Lovefilm started stripping back their subscription model – first they stopped renting games, and then they abolished the pay as you go model, forcing everyone onto fixed monthly subscriptions. Not ideal from my point of view, as the number of films I watch per month tends to vary hugely, but it was still generally a good deal. But then at some point Amazon took over Lovefilm, and chaos ensued. All Lovefilm subscribers have been forced to merge their subscriptions with their Amazon account, and the Lovefilm site has been discontinued. The postal service has been renamed ‘Lovefilm by Post’ and the streaming service, ‘Lovefilm Instant’, has been given the dreadful moniker ‘Amazon Prime Instant Video’ and been separated entirely from the postal service. I’d signed up for Lovefilm Instant a few months before its migration to Amazon because it was advertised as being free with one of the monthly postal subscription packages. However, it’s clear that whereas once the streaming service was an extra on top of the postal service, the opposite is now true. In fact, the postal service has been so badly implemented into the Amazon website that I’m certain it will be abandoned entirely by Amazon very soon. I tried to change my postal subscription earlier so I could receive two discs at a time instead of one, and it appears that all options to adjust postal subscriptions have been removed – the only option was to cancel my account. If that’s not a sign that Lovefilm by Post is not long for this world, then I don’t know what is. But I’m not ready to abandon my postal DVDs just yet, because streaming just isn’t fit for purpose in its current form. For a start, internet connections just aren’t reliable enough – I have BT Infinity but I still experience buffering and picture quality reductions when viewing at peak times, which annoys the hell out of me. Then there’s the paltry selection of titles: most of the films on my Lovefilm rental list are unavailable for streaming, and it’s a similar story over on Netflix. A couple of months ago, Ian and I took out a trial subscription to Netflix in an attempt to watch a few of the films that had been recommended to us: out of the 50+ films on the 101 Films list of recommendations, only 5 were available to stream. Then there’s the problem of films being taken off the streaming list. I added The Battle of Algiers to my ‘watch list’ a couple of months ago, but when I wanted to watch it over the weekend I found that it had been removed for some reason. And not long before that, the same thing happened with Peeping Tom. It’s like putting a DVD on your shelf and then finding it’s been taken without warning when you go to watch it. 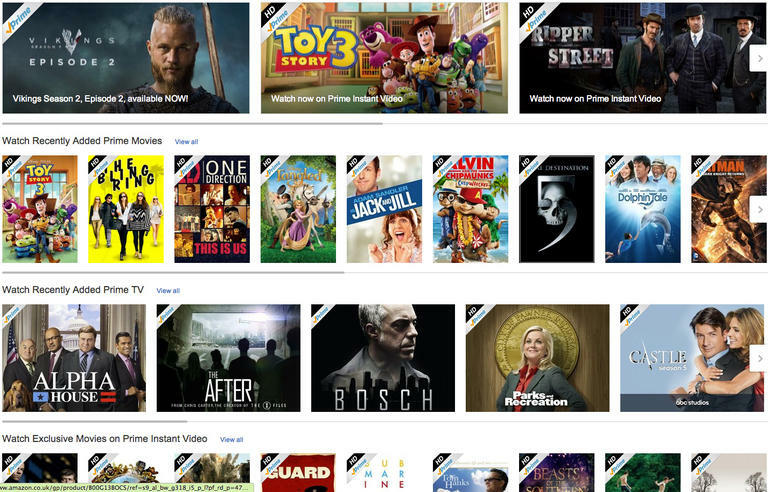 And with Amazon Prime Instant Video in particular, the user interface is utterly dreadful. For some bizarre reason they’ve mixed two subscription models together: Amazon Prime and Amazon Instant Video, as well as paying for individual films. After weeks of using it I still can’t get my head around how it works – in essence it just means that when I click on a film I want to watch sometimes I get told it’s not covered by my subscription and I have to pay extra for it, which is as annoying as it sounds. Visually too, both Netflix and Amazon push a handful of titles and make it very difficult to go hunting for anything that’s not being promoted. No, I don’t want to watch Jack & Jill. All of these problems are likely to be fixed with time. But right now, streaming is the poor cousin to postal DVD rental services in terms of reliability, picture quality and, most importantly, choice. Yet as consumers, we’re being forced onto streaming whether we like it or not: the only DVD rental services still going are Lovefilm and Cinema Paradiso, and as I said earlier, signs are that the Lovefilm by Post service might be not long for this world. Streaming services are useful, and they’re a great way to find something to watch when you’re at a loose end. But until we have 100% reliable connections, consistent HD picture quality and a decent range of choice, they’ll be an optional extra. And after my trials and tribulations with Amazon’s lacklustre streaming service (and Netflix, for that matter), they are an optional extra I’d rather do without.